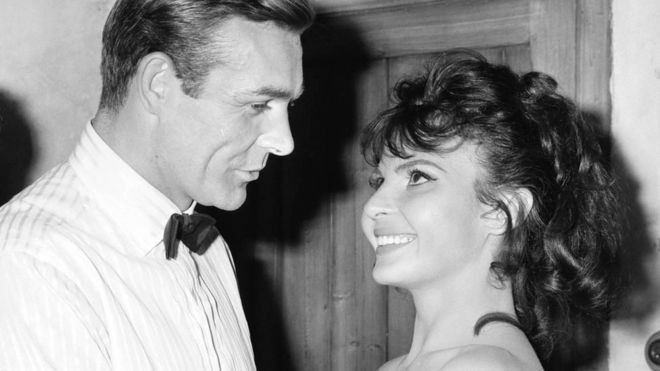 Actress Nadja Regin, who appeared in two James Bond movies, has died at the age of 87. The news was announced on the official 007 Twitter account, which said: "Our thoughts are with her family and friends at this sad time." In 1963, she was cast as the mistress of MI6 station boss Ali Kerim Bey in From Russia With Love. She also filmed a short pre-credits role opposite Connery in Goldfinger, released a year later. In that film, she was seen as nightclub dancer Bonita when a honey-trap attempt to seduce Bond goes awry. Born in Belgrade, Serbia, Regin began acting at home and in Germany before moving to the UK in the mid-1950s. She went on to act in several British movies before landing the role in From Russia With Love. In the 1970s, Regin worked for companies such as Rank Film and horror producers Hammer, selecting film scripts for production. In 1980, she co-founded Honeyglen Publishing Ltd and recently published her own novel, The Victims and the Fools, under her full name Nadja Poderegin. The book is a war-torn romance between an idealistic poet and a beautiful dancer during World War Two. Who is Ukraine's newly elected president?